Contents: Preface; Outlawing Genocide: A crime without a name; The contours of genocide; Genocide in crime codes. Calling to Account: Prosecuting under a quasi-genocide statute; Prosecuting without a genocide statute; Prosecuting under a true genocide statute; Prosecuting in international courts; Suing in the world court. Genocide's Legal Environment: Ex post facto genocide; Treaty violation or crime; Genocide in customary law; The UN Security Council and genocide. Genocidal Intent: The acts of genocide; Genocide by killing; Destroying a group; Instant destruction; Intent without intent; The motives for genocide; The intent of others. The Victims of Genocide: The numbers game; Identifying a group; A group in the eye of the beholder; Genocide by mistake. The Scale of Genocide: Retail genocide; Wholesale genocide; Local genocide; Targeting important persons; Targeting political opponents. Techniques of Genocide; Ethnic cleansing and genocidal intent; Ethnic cleansing in the courts; Human habitat; Aerial genocide; Nuclear genocide. 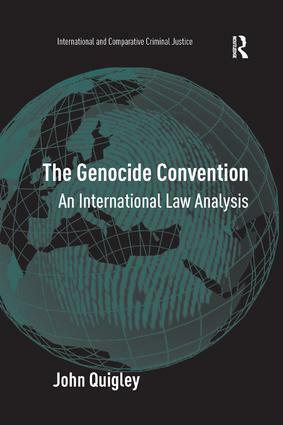 Genocide by a State: Opting out; The Convention's curious omission; States as criminals; States as perpetrators of genocide; Other routes to jurisdiction; States as intermeddlers; A legal interest in genocide; Compensation for victims. Why Genocide? : The World Court's power; The need for genocide; The power of domestic courts; The deterrent value of genocide; Appendix; Bibliography; Index. Professor Quigley is Presidents' Club Professor of Law at the Moritz College of Law, The Ohio State University, USA. He is active in international human rights work and his numerous publications include books and articles on human rights, the UN, war and peace, east European law, African law, and the Arab-Israeli conflict. Professor Quigley served as an expert witness on the law of genocide in the first criminal prosecution charging genocide as defined by the Convention on the Prevention and Punishment of the Crime of Genocide.